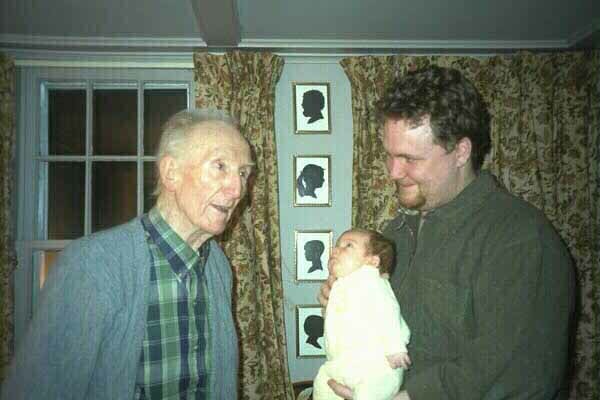 My Grandfather was born in Belfast, Ireland in 1908. After tales long in the telling, he came to America at a bit over 21 years of age. He had had to drop out of school after 7th grade to become an apprentice at at the shipyards of Belfast so, in his words: In September 1931 I applied and was admitted as a full time student in East Junior High School. I was 23 1/2 years old but no one seemed to mind my presence in the eighth grade. In the next year I entered high school and graduated in January 1935. With a scholarship to Columbia University, I was on my way. W. Gamble, A Family Affair, 1995. He went from the 8th grade to high school graduation in 3 1/2 years and graduated from Columbia University with a Masters in another 3 1/2 years. He went on to a lifetime of teaching, which was no surprise to any who knew him. Among his many students were Corretta Scott King and Jeannie Childs, wife of Andrew Young. Upon his retirement many years ago, he split his time between expanding the depth of his own knowledge and sharing the same with others. Much of what I am is from my grandfather. Ever challenged and challenging; stubborn, perhaps to a fault; boundless humor and a ribald wit; and a sense of place in the universe that only the Irish seem to share. Most of all, he gave me my passionate love of the written word and the thoughts, dreams and realities that can be created with them. Having said that, I find that I lack the words to fully express the depth and breadth of my love of my Grandfather and the emptiness created by his passing. I have decided that I will write again, partly for pleasure, partly in hopes of success...and partly because I can think of no more fitting tribute to Granddaddy. I rest comforted by the knowledge that he knew how much I loved him as I have always known his love of me... Rest, be merry and dance for the ages.